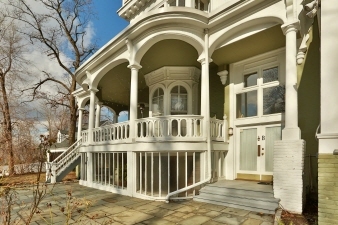 Just move in to this Very special and newly updated 2 bedroom Duplex Condo in the heart of Historic Tarrytown in a picturesque Victorian Mansion. Magnificent details and a bit of a river view await the next lucky owners including a grand porch with a sunroom below, private entrance from exterior directly into home, huge living room with 12' ceilings & pristine plaster cornices, pilasters and center medallion, Master suite and new master bath both with 12' ceilings. Beautiful & practical all new kitchen with stone counters and stainless appliances, a Family Room, 2nd Bedroom and full Bath, laundry and more. Enjoy golden sunsets and beautiful light from many windows. Walk to Tarrytown train station and Main Street. A treasure! Current Taxes Listed Before Basic Star Deduction of $2,005. Please note that Town property re-valuation should result in lower taxes. Please see Town of Greenburgh for more info. Level 1 - (Entry hall, down to closet, powder rm, laundry, Dining Rm, Kitchen, Family Room, Sun Room, Bedroom, Full Bath) Level 2- (up to Master Bedroom and Master Bath, Huge Living room, Covered Porch with exterior stairs by patio) Basement: Common, Unfinished. Please contact Andrea for Real Estate Results!